A modern spacious hillside villa with indoor and outdoor living areas, and palm-fringed sea views. Amenities satellite TV/DVD player, air-conditioned bedrooms, ceiling fans throughout, fully equipped kitchen. Wild Palms Villa is a beautifully appointed house, brightly furnished with an eclectic collection of designer furniture and Asian artifacts. 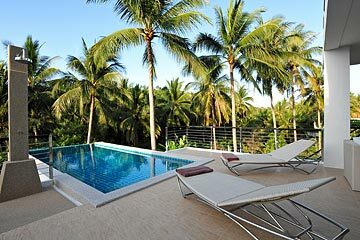 The villa is situated on a hillside within the exclusive Santi Thani estate, overlooking the north coast of Koh Samui. The 3 bedroom property is designed in 4 split levels, with 2 main entrances. At the bottom level is an indoor dining room, equipped with a stereo system and iPod dock. Glass doors open onto the spacious pool deck and tropical views. The deck includes a covered lounge area, furnished with sofas and coffee table, and sun loungers. The infinity-edge swimming pool faces the views of the surrounding wild palms, and has an outdoor shower. A flight of stairs leads up to the first floor, with a fully-equipped kitchen furnished with a dining table, separated by a wide foyer from the first bedroom. The kitchen and the foyer open to the car port at the rear. The bedroom features a king-size bed, a rounded wall with windows facing verdant views, and an en-suite bathroom with a tub, twin sinks, and walk-in shower. Upstairs, the double vaulted living room includes 2 comfortable sofas, white leather lounge chair, and traditional Thai loungers, and is equipped with an LCD TV/DVD. Glass doors open onto a large balcony overlooking the pool and sea views, and furnished with a Panton dining set. An open stairway leads up to a large foyer, with a double bedroom on either side, as well as a guest bathroom. Both bedrooms feature private balconies with sea views. All bedrooms are air-conditioned, with en-suite bathrooms, ceiling fans, built-in wardrobes, and polished wood floors. Wild Palms Villa is located in a quiet residential neighbourhood, nearby the Santiburi championship golf club. The private estate is the largest and most spacious private villa development on Koh Samui, with well-established and landscaped grounds, and guarded security gates. The towns of Maenam and Nathon are a short drive away, and there are many local seafood restaurants along the nearest beach at Bang Por. *Rates are specified in Thai Baht, inclusive of 3% service and 7% tax. *Airport transfers are charged at 250 THB per person, per trip, except for children under 12. *Minimum rental is 5 nights. Minimum stay between 15 December-14 January is 10 nights. *Check-in time is 15:00. Check-out time is 10:30. *Chef service can be arranged, subject to availability, at a charge of 250 THB per hour, including shopping time, and exclusive of provisions.